By DORCAS APOORE, Mastercard Foundation Scholar at Camfed, member of Camfed’s CAMA alumnae network, and founder of the non-profit organization, Advocacy for Social Inclusion and Girls’ Education (ASIGE), Ghana. It was a dream come true. I could hardly believe that I was going to fly for the first time. The night before we got on the plane, I couldn’t sleep for imagining how it would be. When I landed in South Africa, I was welcomed by the Baobab 2017 flyers and students from all over Africa who had also come to Johannesburg to attend the Mastercard Foundation Baobab Summit. On the theme of #GiveBack, this year we discussed tackling poverty through social inclusion, social entrepreneurship and collective action. Throughout the discussion, we realized that Africa cannot develop as a nation unless more women are educated. We concluded that when women take leadership positions in society, they will take action not only by investing in the education of their own families but by helping reduce poverty throughout their communities. Education has given me knowledge, skills, and a heart to love people beyond my community, bringing about change and empowering women. I can use my own experience as an example. Without education I would have been in the streets or married with children by now. Education has given me knowledge, skills, and a heart to love people beyond my community, bringing about change and empowering women. Across Africa, countless more women are doing the same, but none of this is achievable without education. When I completed secondary school, I joined CAMA, the alumnae association of over 84,000 Camfed graduates. We are community philanthropists, finding effective, innovative and sustainable ways to give back, plowing the benefits of our education back into society. Our power lies in finding solutions to everyday problems that others may not see and bringing change where it is needed most. From our own struggles, we understand the vital role that education plays in turning the tide of poverty, and how being excluded from education can mean being excluded from financial independence, decision making, and even control over our own futures. Social entrepreneurs are people who are passionate about their society. They are always ready to bring about change. They are the ones who identify a problem, and think why, how and what is the solution. In this way, the Baobab Summit taught me that I am a social entrepreneur. I grew up in an extremely poor family in northern Ghana. My mother was married from an early age, and she never had the opportunity to go to school. With children to support, she became stuck in a cycle of low-paid menial labour, struggling every day to provide our basic needs, not to mention school fees, uniforms, and books. As I grew up, I saw first-hand that this is how poverty becomes a cyclical barrier to education, and this is why I founded my NGO, Advocacy for Social Inclusion and Girls’ Education (ASIGE). 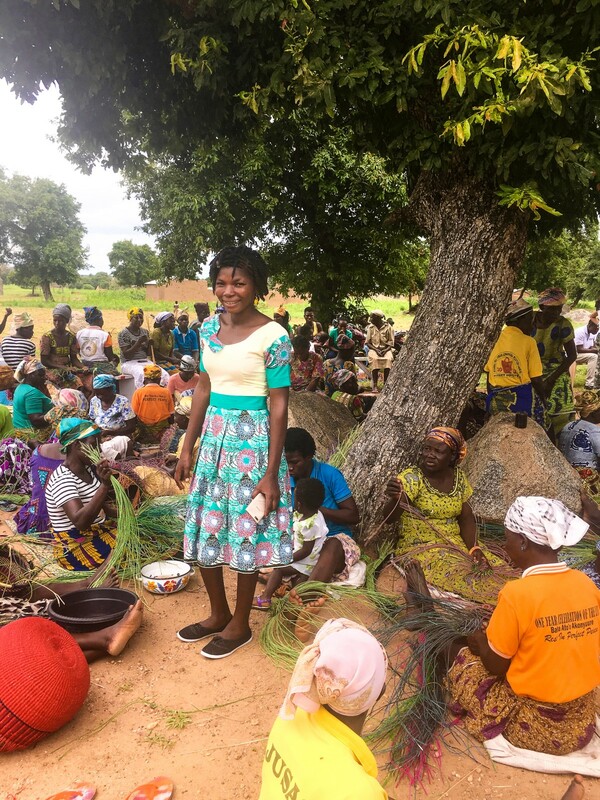 We provide sustainable skills training for women from my region who weren’t able to complete their education, skills such as basket weaving. 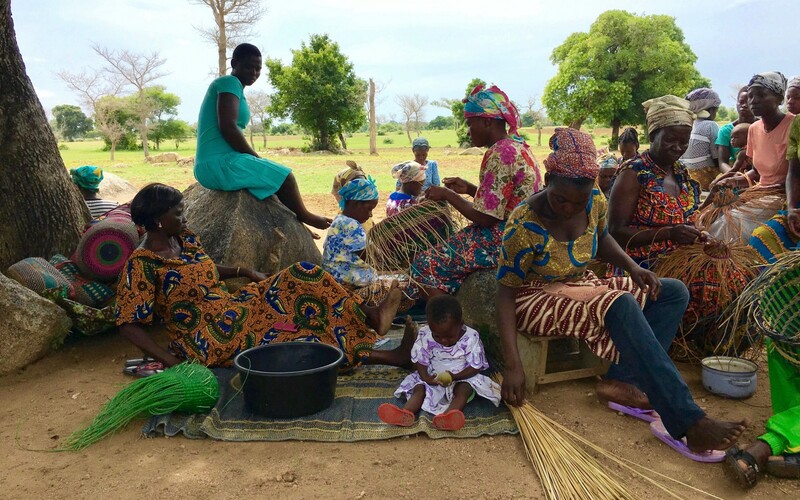 Using straw, rubbers, beads, dye and fabric (kente and batakari) the women make baskets that can be sold to generate income for their families. Social entrepreneurs also have to assemble a team of like-minded people who are willing to work for the common good and impact positively on society. It took me two years to assemble my team for ASIGE, which includes a finance expert, educationists, traditional leader, and development planners. With this team, ASIGE is able to develop critical solutions to challenges that women and girls face in our society. Educating a girl has a multiplier effect on reducing poverty from the individual level to national level. Education isn’t just for school, it’s for entrepreneurship and empowerment, and these baskets represent improved living conditions and financial independence, as well as a long-term solution to the unemployment and rural-urban migration rates that are so high and make women so vulnerable in my region. With the help of my board and team, I am developing a microfinance fund and financial literacy training program to provide women with the knowledge and resources they need to build their own businesses and save for the future. The women reinvest their earnings into their families, and their children’s education. Therefore, educating a girl has a multiplier effect on reducing poverty from the individual level to national level. From a young age, these girls will have ownership of their lives and their decisions, and won’t be excluded from opportunities to succeed and progress into leadership positions, employment and independence. Challenges are the ladders to success, and I will never give up in my quest to empower society through education. At the Summit, speaker Ivy Mwai said “If it is to be, it is up to me”. With my education, the support of my CAMA group, and my commitment to change, I am filled with confidence in my ability to lead the charge for change in Ghana. Social entrepreneurs don’t see problems as problems, but as challenges that need critical thinking and sustainable solutions. Challenges are the ladders to success, and I will never give up in my quest to empower society through education. I look back on my journey and smile because I know that next year, many more passionate, determined and educated young women from rural Africa will be on their way to the Baobab Summit 2018, flying for the first time. 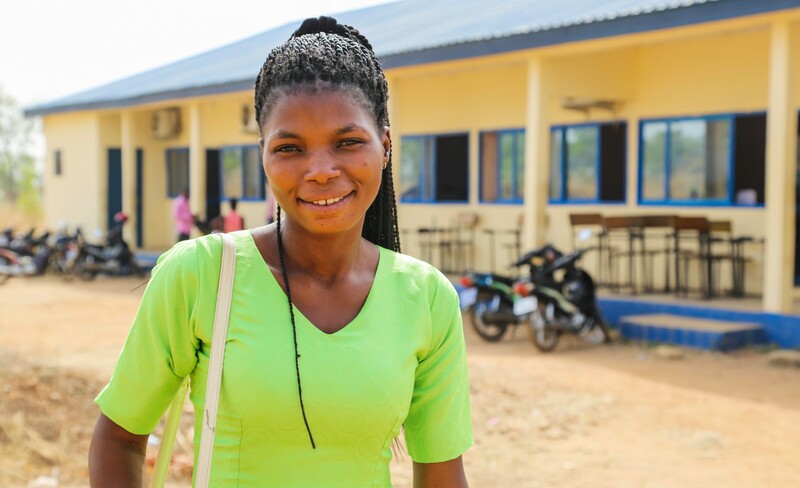 As a member of CAMA, the 84,675-strong and growing pan-African Camfed alumnae network, Dorcas is deeply committed to ‘plowing back’ the benefits of her education into her community. 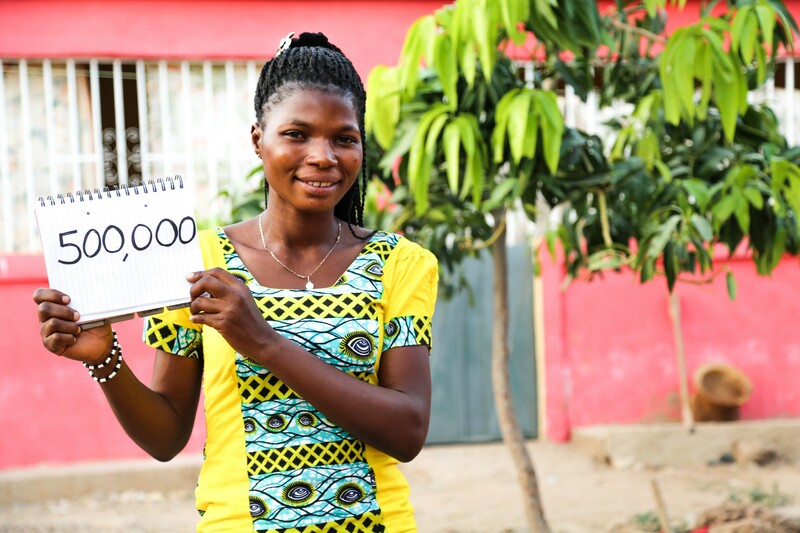 She is proof that when a girl in rural Africa has an opportunity to progress through education she will help turn the tide of poverty, unlocking opportunities for herself and others along the way. Girls’ education is the best investment we can make for the future of our world. If you believe in the work Camfed is doing, please lend your support. Breaking the cycle of poverty & inequality by educating girls & investing in young women's economic & leadership opportunities.